Gail Parazynski knew she had found her church home when she learned that First Presbyterian Houston provided a ministry for the congregation’s special needs children during Sunday morning worship. “[This church] is such a haven [because] there was really no place for a family with special needs to go,” she says. The WinGS (Walking in God’s Spirit) program, designed for children age 2 to 18, includes playtime, prayer, music and a Bible lesson. The open-spaced room, equipped with comfortable chairs, a swingset, a soft climbing area and a small trampoline, enables students to move freely but safely in a contained setting. The students, most of whom have autism or Down syndrome, are paired with a WinGS volunteer buddy who works with them one-on-one. Marsha Cayton is one such volunteer. “The joy that I see when the children walk into the room fills me up for the rest of the week,” says Cayton. Stacey Rockwell, director of children’s and family ministries at the church, notes that every family with a special needs child has, at some point, encountered a situation in which they didn’t feel welcome or wanted. At First Presbyterian Houston, however, they are embraced. For families who had abandoned the idea that they could ever regularly attend church, First Presbyterian Houston, whose average weekend attendance is 1,000, is a godsend. Mark Carleton, a WinGS parent, says the program provides peace. 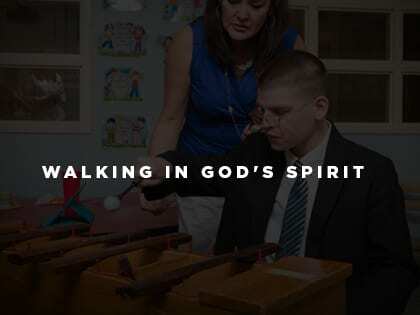 “On Sunday mornings when we’re in worship, we’re at ease, knowing that our son is being cared for by people who know him, love him and understand his special needs,” he says.